Small but mighty, this compact unit promises to become our hottest seller! Created in response to consumer demand, this unit is a SUPER size of the popular Ark III kit, which has already sold tens of thousands of units. 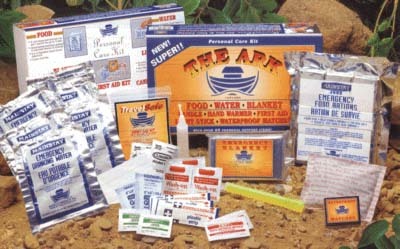 It can support one person for three days with over 30 items including: food and water with a five-year shelf life, a first aid kit, hand warmer, light stick, safety matches, candle, and blanket.